Willowplace is a CFA Cattery of Excellence, a TICA Outstanding Cattery and a Breeder Member of MCBFA since 1981. MCBFA is an international, independent breed organization dedicated to the maintenance and preservation of this amazing breed. We have been consistently producing Supreme Grand Champions since 1983. Willowplace was established in 1981. The health of our kittens/cats is our foremost concern. All adults are screened for Hypertrophic Cardiomyopathy (HCM) and Hip Dysplasia (HD). We are located in the rolling foothills south of Greenville, South Carolina. The cats graciously share their home with us. 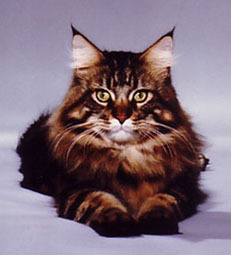 Barbara is an Allbreed judge with TICA (The International Cat Association). Cliff retired from a large foodservice distributor. Bucky and Lilly, shown on this page are two of the "Great Cats" we have been fortunate to know and love at Willowplace. 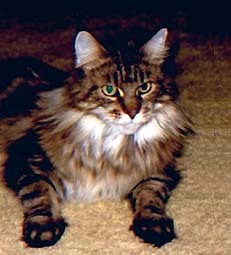 We often have quality pet, breeder or show kittens available. Many people think of Willowplace as specializing in browns and silvers with and without white. We do have a lot of those, but Cliff thinks dilutes are great, particularly blues and blue silvers, so we have quite a few of those. Cliff likes smokes, reds, red silvers, creams and bi-colors too, so those keep turning up. Did I mention solids and bi-colors? In short if you looking for a kitten of any color, get in touch. To the best of our knowledge and belief, the pedigrees presented in this web site are true and correct.